As a life-long passionate baker, Sal Daklala, owner of the Biblos Mediterranean Fare restaurant at Mount Royal University, is breaking into the industry of flashy and fatty chain giants with some home-cooked and healthy ideas. While many restaurants get pushed out of the way by large chain industries, Daklala kept hold of his dream of educating people about the food that inspired him. He started an educational program for young students. Daklala and his marketing manager took their vision to a school board, explaining that they wanted to educate students about pita bread — how to make it and the history behind it — and the board liked their concept. For Pita’s Sake is now in schools around Calgary for students in grades one to five. Daklala said people come up to him and say they remember Biblos coming to their school when they were kids, and they have pita bread in their households now. Daklala started as a baker and later opened his first restaurant in 1975, orginally called Byblos Bakery, which featured flatbreads, calzones and baklavas. Then he moved on to the process of franchising and opened a second location at MRU. “I started from scratch because no one really knew about pita bread at that time,” he said. 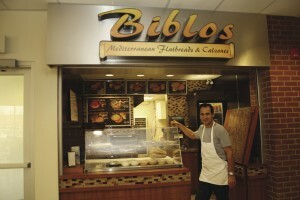 Daklala wasn’t concerned about being just like every other chain restaurant, but wanted Biblos to matter in a bigger way; his real vision was for flatbread to be a popular new meal for families to bring to the table. Daklala’s story is still going. He and his family have worked hard and are still working hard to build Biblos even further. He has plans to continue branching out by creating another venue in a few years.